A HUMAN PERSPECTIVE A Congo riverboat ride from Kinshasa to Kisangani in the Democratic Republic of the Congo is a journey all visitors should take. The riverboat is essentially a floating village. Each barge shakes with music and dancing. In addition, the Congolese fill the riverboat with market stalls stocked with all types of food. The smell of smoked fish and a variety of live animals, including monkeys, tortoises, and crocodiles, fills the air. Farmers slaughter pigs and goats on board, and merchants bargain with each other for a range of products. The journey can present a valuable snapshot of life in Central Africa. 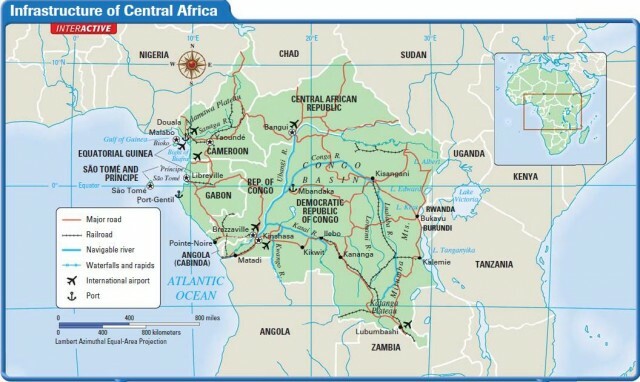 Central Africa includes Cameroon, Central African Republic, Democratic Republic of the Congo, Republic of the Congo, Equatorial Guinea, Gabon, and São Tomé and Princípe. Europeans first began their African colonization in Central Africa. The Bantu are a group of peoples and cultures who speak one of the Bantu languages. Beginning around 2000 B.C. in what is now southeastern Nigeria, the Bantu people moved southward throughout Africa. On the way they spread their languages and their cultures. 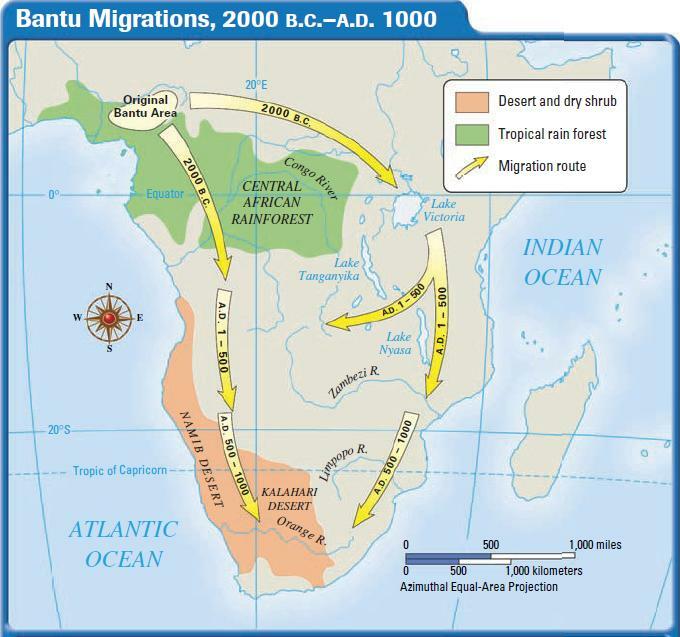 This mass migration is called the Bantu migrations. The Bantu may have begun this journey because of a land shortage. The Bantu migrations are a key event in Africa’s history. They produced a great diversity of cultures but also helped link various areas of the continent. Today, around 120 million Africans speak one of the hundreds of Bantu languages. Europeans wanted slaves for their plantations in the Americas. In the 15th century, the Portuguese established the island of São Tomé off the coast of what is now Gabon as the initial base for trade in African captives. European traders traveled to Africa and waited on the coast. African merchants then brought potential slaves to them. The merchants traded for guns and other goods. Many African rulers took part in the slave trade. They already had been selling slaves to other African rulers and Arabs. So, they saw no difference in selling them to Europeans. Some Africans, however, objected. One African ruler protested to the king of Portugal. Nevertheless, by the end of the slave trade in 1870, Europeans had transported millions of slaves to the Americas and Europe. In the mid-1800s, Central Africa consisted of hundreds of different ethnic groups, which followed traditional religions and spoke hundreds of different languages. Politically, they ranged from large empires to small villages. Europeans had been in Africa since the mid-15th century but had stayed mainly on the coast. The rugged interior geography of Africa prevented further movement. But that changed when King Leopold II of Belgium developed an interest in the Congo after it had been explored in the 1870s. He wanted to open the African interior to European trade along the Congo River. By 1884, Leopold controlled this area and paved the way for the Berlin Conference, which you read about in Section 1. The Berlin Conference established this area as the Congo Free State. Leopold used forced labor to gather rubber, palm oil, ivory, and other resources. During the 19th and 20th centuries, primarily the Belgians and French colonized Central Africa. Most Central African countries gained their independence in the 1960s, but the borders imposed on the Africans during colonialism posed problems. Those borders disrupted long-standing systems of government in Africa, did not consider ethnic regions, and grouped traditional enemies together. Before colonization, a village, a tribal chief, or a group of elders would consult with various leaders within a village to make decisions that affected only that village. This type of organization is a stateless society, which you read about on page 443 in Section 3. During colonization, Europeans installed more centralized governments that destroyed the organizing principle of stateless societies. After colonization ended, new African governments in the 1960s were then forced to govern a diverse population. Inexperienced leaders were often corrupt and abused their power. The economic geography of Central Africa is similar to that of the other regions of Africa. Many of the countries suffer from a lack of infrastructure and rely too much on the export of raw materials. Central Africa’s economy is still recovering from the effects of colonialism: the loss of resources, the disruption of its political systems, and the cultural and ethnic oppression of its people. European colonizers invested little in Central Africa. The only economic infrastructure they developed was to aid the removal of raw materials. They left little money to develop roads, railroads, airports, or a productive education system for the people of those countries. A good example of economic problems caused by colonization can be seen in the Democratic Republic of the Congo. The country possesses huge amounts of natural resources such as gold, copper, and diamonds. However, European colonization and a personal desire for power and riches by postcolonial leaders left the country in a state of disarray. In the Democratic Republic of the Congo, for example, Mobutu Sese Seko, the country’s leader from 1967 until 1997, brought the country’s businesses under national control. He then began to take kickbacks in order to profit from this reorganization. The country’s economy, educational system, and social structure began a rapid decline thereafter. Mobutu used the army to maintain his own power. His regime finally gave way in 1997 to that of Laurent Kabila. But Kabila’s leadership only led to more violence in Central Africa. By 1999, Angola, Namibia, Zimbabwe, Chad, Rwanda, and Uganda all had troops in the Democratic Republic of the Congo and were competing for its territory and resources. In 2001, Kabila was assassinated, and his son Joseph succeeded him. The Democratic Republic of the Congo is still struggling to establish a stable political system. Central African art shares common ideas and themes with art in other parts of Africa, including expressions of traditional African cultures and the struggle against colonialism. For much of the 20th century, some of Central Africa’s art has reflected attitudes toward colonialism. After having attained independence in the 1960s, however, these countries wanted to establish their own identities. As a result, many countries banned Western influences in their art. For example, in the 1970s, Mobutu Sese Seko launched a program to promote African—in particular, Congolese—culture above that of the West. Artists who participated wanted to recover the personality of African art by using materials they considered African in origin. Today, artists from a new generation who did not experience colonialism are coming of age. They are focusing on issues of political instability, urban life, social justice, and crime. Prior to the 20th century, few people in Europe knew much about African art. However, in 1907 the famous Spanish artist Pablo Picasso saw a display of African Fang sculpture in Paris, and it captivated him. After that, Picasso began using African themes in his work. The Fang, who live in Gabon, southern Cameroon, and Equatorial Guinea, are famous for their carvings. They carve wooden masks, which are painted white with facial features outlined in black. They also carve boxes that contain the skulls and bones of deceased ancestors. These boxes are decorated with figures to protect their contents. In recovering from the effects of colonialism, Central African countries are placing their hopes on education. Improved education should produce more skilled workers and citizens who are better able to participate in democratic governments. Adequate schooling for many of Africa’s young people is in short supply. In 2001, experts estimate that less than half of sub-Saharan Africa’s 16- to 20-year-olds attend school. Education problems in Central Africa include a shortage of trained teachers, a high dropout rate, and a shortage of secondary schools. Central Africa’s more than 700 languages also pose barriers. The language used in school is often different from the one used at home. For example, in Gabon—a former colony of France—French is the only language of instruction, though most people speak one of the Bantu languages outside the classroom. Students’ education varies in Central Africa. In Cameroon, most children leave school at around the age of 12. In the Central African Republic, children between the ages of 6 and 14 are required to go to school. Many Central African countries are improving their educational systems, however. In 1991, Cameroon created two new universities. In addition, Libreville University in Gabon, founded in the 1970s, now has more than 4,000 students. The Republic of the Congo offers vocational, agricultural, and teacher training courses. In addition, many countries are starting programs to educate young people about health care issues such as the spread of disease. Those countries hope that better education will slow the spread of AIDS, the Ebola virus, cholera, and other diseases.